Provide comfort for the family of William McFadden with a meaningful gesture of sympathy. 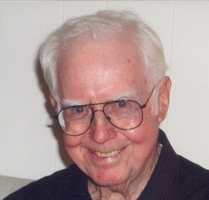 William F. McFadden, 91 of Spring Lake passed away on January 23, 2019 at Jersey Shore University Medical Center, Neptune with his loving family by his side. He was born on June 4, 1927 to the late Charles and Mary McFadden. William was a longtime resident of Kearny, NJ. He served in the United States Army in the 6th Air Vehicles Repair Squadron. Following his honorable discharge in 1947, he enjoyed a forty year career, including several management positions with Verizon Communications. William was an avid golfer and always enjoyed an afternoon at Monmouth Park with family and friends. William was predeceased by his loving wife of 34 years Sheila in 1989; his sister Helen and brother John. He is survived by his children Kathleen Tetley and her husband Joseph and Thomas McFadden and his wife SiUn Cha. William is also survived by his grandchildren Emily Tetley, Sarah Ritter and her husband Jonathan, Hannah and Owen McFadden; great grandchildren Lilah and Benjamin Ritter; his two brothers Charles and Edward McFadden. Family and friends are invited to attend a visitation on Sunday, January 27, 2019 from 1-5 pm at Orender Family Home for Funerals 2643 Old Bridge Road, Manasquan. A Mass of Christian Burial will be 10:30 am on Monday, January 28, 2019 at St. Margaret Church, Spring Lake. Interment will be private at Immaculate Conception, Montclair. In lieu of flowers memorial donations may be made to the American Cancer Society PO Box 22478 Oklahoma City, OK 73123. To send condolences to the family please visit www.orenderfamilyhome.com. To send flowers in memory of William Francis McFadden, please visit our Heartfelt Sympathies Store. Provide comfort for the family of William Francis McFadden by sending flowers. Please accept my condolences for the loss of your loved one William. What has helped me to endure the pain of losing a loved one in death is knowing that sickness, death and the pain they cause were never Jehovah God's purpose for us. To give us comfort and hope He gave His very own son Jesus and many Bible promises. Such as Isaiah 33:24, which promises that sickness will be gone forever! John 5:28-29 promises that our loved ones who have passed away are in God's memory waiting for His son Jesus to call them back to life! Imagine seeing your dear William again! What a wonderful time that will be! In time if you would like to know more about God's promises and how they will be fulfilled through His son please visit jw.org. Again my condolences.